There's a village where life doesn't seem quite real. Where you feel you're in a fairy tale. It's enchanting Macugnaga. 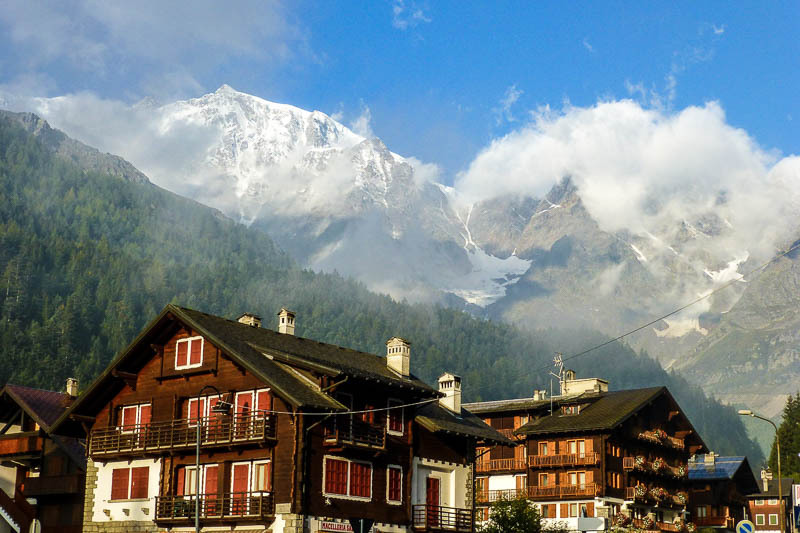 This delightful article about Macugnaga was shared with us by J Lee Barton and if you'd ever like to visit this dreamy little town then where better to stay than the Dream Hotel (click for more). We arrived after a two hour bus ride from Lake Maggiore on the 23rd of December. I was determined to have a white Christmas this year and I am afraid we don't get snow usually until about February on Lake Maggiore so I wanted to make sure I got my wish by booking into a hotel there for four nights over Christmas. This area is a skiers and hikers paradise but not on the normal tourist map which is another reason I chose it. We checked in to our hotel and were given a great room with two balconies overlooking the central piazza which was perfect for taking photographs. After a nice lunch in the hotel dining room we decided to explore. We found a market/general store only a block away called surprisingly enough Tourist Market. They had everything we needed for munching and sandwiches and also wine so we did a bit of stocking up. The owner Robbie was very kind and helped us on several occasions during our stay. Afterwards we had a stroll, just checking out our new temporary home. Our little dog Magic has had some experience with snow but not much so we were curious how he would react. No problem! He just had a major sniff around and quite enjoyed himself in his brand new surroundings. 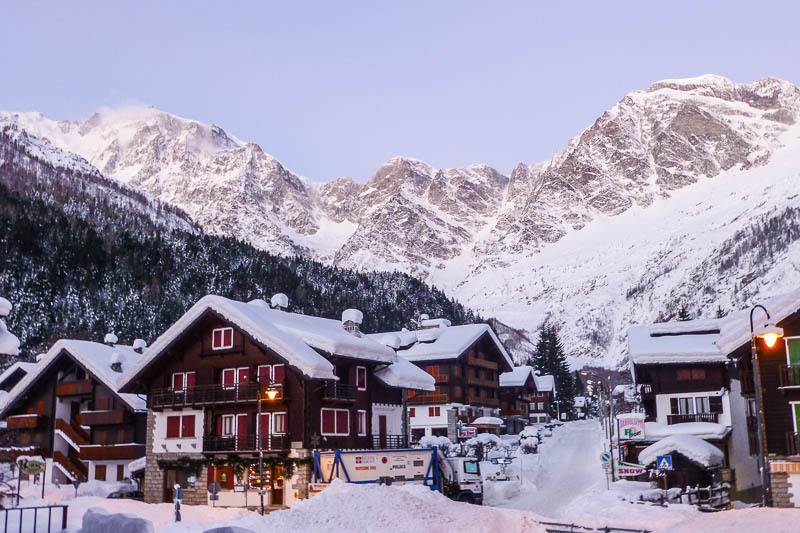 Macugnaga began its life when the ancient Walser people of Germanic decent made their way across the high rugged mountains from Switzerland many centuries ago and settled right at the foot of Monte Rosa, the second highest peak in the Alps at 15,217 feet. This migration began in around the 10th century and continued for approximately 300 years. The reason for this migration is unclear but some believe that it was because of conflicts with the feudal lords that ruled at that time. For whatever the reasons may have been many of the alpine villages in this area were settled by these people. The oldest church in the village was built in the 14th century. The next morning we awoke to glorious white flakes cascading from the sky and making the whole area pristine again, all wrapped up in soft cotton wool. The mountains were of course closed from view but it didn't matter. I stepped out onto the balcony and turned my face skyward, relishing the soft touch of snow on my face. It reminded me of the song from the Sound of Music, "Favorite Things" and "snowflakes that stay on my nose and eyelashes". I thought that it must be God's way of celebrating Christmas Eve with white confetti from the heavens. We got dressed and had some breakfast and decided to see if we could find the main cathedral in town which is where they would be holding the midnight Christmas Eve mass later on. We found it finally and it was truly beautiful inside. 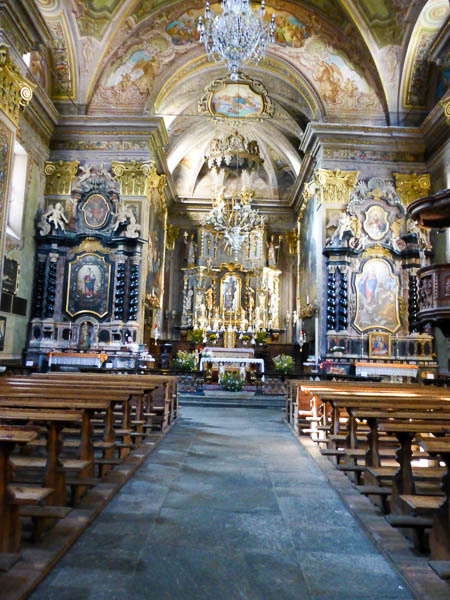 It was built in the 1700s and the craftsmanship absolutely superb with amazing murals, a stunning gold and cream alter, and even a large nativity scene. After spending a few moments taking it all in we made our way back to the piazza. I had never been to a midnight mass before not being Catholic but I really wanted to take in the atmosphere and listen to the choir. Later on in the early evening, Babo Natale (Father Christmas) arrived in the town square complete with two elves with torches to light his way and a huge wicker basket of gifts for the little ones. The children were so excited and came from every direction to get a hug from Santa and a little present. There were two huge loudspeakers in the piazza and after Santa departed they began to play Christmas carols which resonated around the square. I listened to Andrea Bocelli sing White Christmas in four languages, then the lords prayer, and even silent night. It was so magical with the music, the snow and twinkling Christmas lights everywhere. Children were building snowmen, and mothers and fathers were taking their children for sleigh rides, and the family pet was not left out, clothed in warm winter coats and some even had boots. I thought to myself "This has to be one of the most memorable Christmases of my life." After a wonderful day and a good dinner at a local venue we had another stroll and waited for the church bells to chime and beckon the villagers to mass. At the stroke of midnight the bells began to ring. Slowly the congregation was seated. We sat in the back of the cathedral with Magic on our lap and I must admit couldn't really understand a lot of what the priest was saying in Italian but it didn't matter, just being there was more than enough. The choir sang several beautiful hymns and then the priest asked everyone to turn around to the person next to them, take their hand and introduce themselves which we did. It was another moving experience that I will not forget. Afterwards we walked to a local bar for a night cap in front of a roaring fire. Christmas day we awoke to a totally white world. The cars were completely covered, the small snow mountain in the piazza made by snow plows had tripled in size and now was a winter wonderland with children sledding down the face of it. 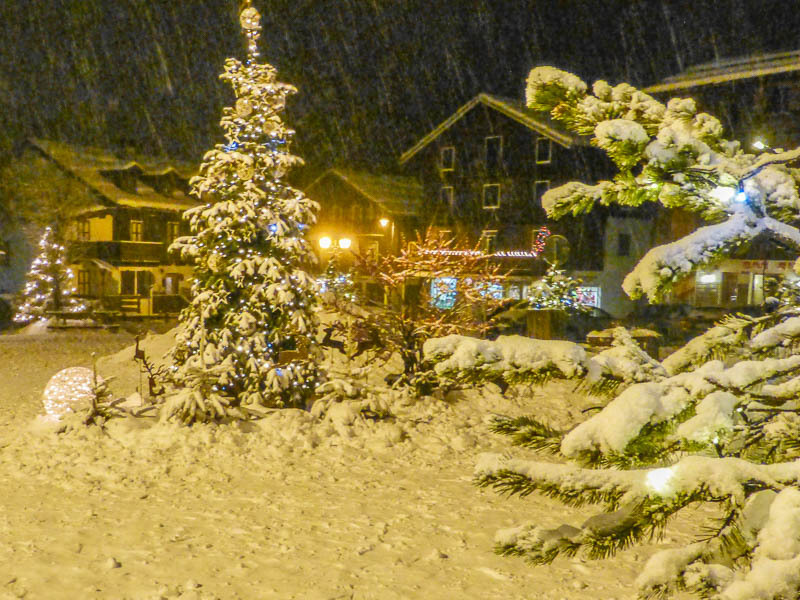 The Christmas tree in the piazza was twinkling with lights shining on boughs creaking with the weight of the snowfall. Our balcony was now covered with about 4 feet of snow making it a bit tricky to take photos but we persevered as the vistas were just too beautiful to ignore. Later on we had a lovely lunch of stuffed turkey roll accompanied by polenta ( a mountain specialty), stuffing and of course a nice white wine. A lovely lazy day was had by all. That night it was as if God decided there had been enough celebrating with white confetti, it was time to show everyone what heaven really looked like. The sky cleared, millions of stars sprang to life and the moon shone on the high rugged surrounding peaks glistening with new fallen snow. It was a natural display to put to shame even the most revered artists. In the morning the first rays of sun turned the aptly named Monte Rosa into crimson, then to pink and finally to glorious gold, a totally breathtaking sight. It was St Stephen's Day and a holiday celebrating the person who is generally recognized as the first Christian martyr. He died in c 34 by stoning as he was tried as a blasphemer who did not agree with the then Jewish hierarchy and their teachings. He is recorded to have been able to have performed many miracles and spent his time helping the poor. Later on that day we found out that there had been an avalanche further down the mountain and the road was blocked to buses. Oops, we were supposed to be leaving the next day so we decided we had better ask our hotel if we could stay another night and they said it was not a problem. 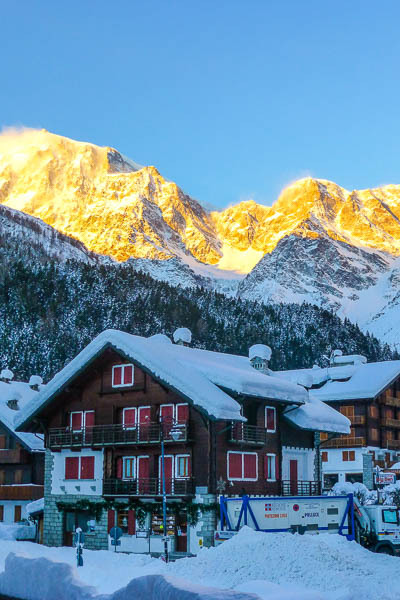 The only problem was that all of the power for the village had been knocked out with the avalanche including lights, heating, telephone and internet. We were in a nutshell stranded. But what a great place to be stranded! I was secretly quite pleased we would be staying another day as I really did not want this holiday to end. That night we all ate by candle light in the dining room. I think the chef must have been a genius to have been able to feed all of the guests with only candles to see by. Luckily the stove was gas so we at least had something hot to eat. An early night ensued as just like in the olden times, when the sun goes down you go to bed.The next day was another cloudless one and everyone was out playing in the snow. The ski lifts were not working and still no power so we all just had fun playing. On the evening of the 27th the power was restored and we decided as it was our last night we would treat ourselves and try to get into what was supposed to be the best restaurant in town in the Hotel Cima Jazzi. We were so lucky as they had a table available. We ordered the specialty which was an eye fillet with Barolo wine sauce, roasted potatoes and vegetables. All of this on a wafer of Parmesan cheese. Without exaggeration we both thought this was one of the best meals we have ever had. It was nothing short of superb! Melt in your mouth steak cooked to perfection covered in an amazing fragrant wine sauce, the vegetables were also cooked perfectly and so were the crispy roasted potatoes. We were given a complimentary home made ricotta starter, and afterwards with coffee a house made, light as a feather, chocolate fudge. This was all accompanied by a fabulous and robust Chianti Classico. We have already decided to make a pilgrimage back to this restaurant for another meal. Absolutely five star in the Alps and as good as any Michelin Star restaurant we have previously dined in. All too soon the next day arrived and we sadly packed our carry bags and made one last stroll to say goodbye to new friends we had made and have one last prosecco on the piazza while enjoying the spectacular view of Monte Rosa. It was a Christmas that will live on in our memories for a very long time.